Lost packages are the bane of all carriers. As an eBay seller, it is your job to ensure your package reaches the buyer. The post office has been dealing with lost packages since they opened the Dead Letter Office in 1825. It was renamed as part of the USPS reorganization in 2011 to the MRC, or Mail Recovery Center. The Mail Recovery Center employees (MRCs) are the only people legally permitted to open lost mail. When an address label gets smooshed, torn, wet, or otherwise illegible — which means the box can’t be delivered — it finds its way into the hands of the folks at the MRC, who open the package with the hope of finding enough information to get it to the rightful owner. Make sure that you always include a packing slip — like the kind you print from Selling Manager or my eBay — inside your packages. The packing slip should have both your address and the buyer’s address so that if the label is illegible, the packing slip will identify the owner and the package can be delivered. Copy and paste the buyer’s address: The safest way to correct addressing is to cut and paste the buyer’s address information from an e-mail or the PayPal payment confirmation or download. Don’t depend on the carrier to correct an address: No carrier is going to tell you whether the address you have is incorrect. Use software or online services to check your buyer’s address: It’s good business practice to confirm the viability of an address before you send your item. 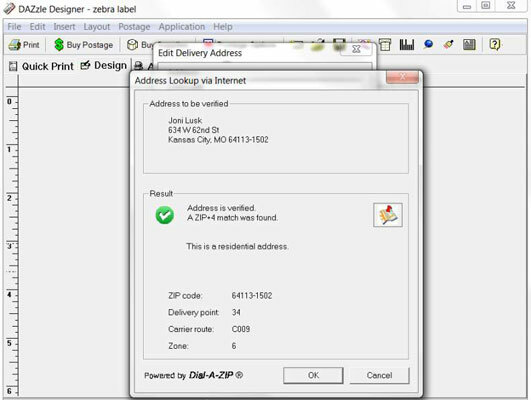 Software such as DAZzle corrects most common addressing errors such as misspelled city or street names. If you have a question about a ZIP code, you can check it at the USPS website. If you have the Google toolbar, or go to Google.com, you can type any UPS, post office, or FedEx tracking number and find the current tracking information from the carrier’s website. Just copy and paste the tracking number into the Google search box and start your search. You’ll come to a page that presents a link to track packages — with your number and carrier showing. Click the link and you end up at the carrier’s site with all the current tracking information. Nice!